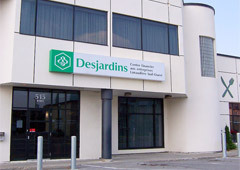 Desjardins Business - Lanaudière houses specialists who are able to meet all your corporate financial needs. Our experts work in partnership with entrepreneurs to offer them business solutions adapted to their reality, regardless of their needs. Because they are committed in the community, account managers and business advisors speak the same language as business people, understand the issues they face, help them with their business decisions and offer a new perspective. Members benefit from the quality of Desjardins services and have access to a vast pool of resources, because it's all of Desjardins supporting your business.